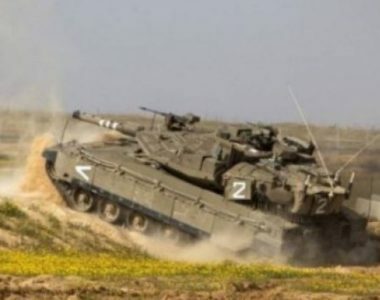 Several armored Israeli army vehicles, including bulldozers, invaded Palestinian farmlands and bulldozed sections close to the border fence, while firing live rounds, east of the al-Qarara town, northeast of Khan Younis, in the southern part of the Gaza Strip. Media sources in Khan Younis said the tanks, and bulldozers, came from military bases across the border fence, and advanced 150 meters into the agricultural lands. The soldiers bulldozed sections of the invaded Palestinian lands, close to the border fence, and placed sand hills while firing live rounds to keep the Palestinians out of their lands. Media sources said one of the armored bulldozers flipped over, during the invasion. Such invasions into Palestinian lands in the border areas, north and east of the Gaza Strip, are carried out frequently, and the Palestinians are forced out of their lands until the army leaves.